Edible Methods: take three tablets daily. Glutamine (abbreviated as Gln or Q) is one of the 20 amino acids encoded by the standard genetic code. It is not recognized as an essential amino acid, but may become conditionally essential in certain situations, including intensive athletic training or certain gastrointestinal disorders.Its side-chain is an amide formed by replacing the side-chain hydroxyl of glutamic acidwith an amine functional group, making it the amide of glutamic acid. Its codons are CAA and CAG. In human blood, glutamine is the most abundant free amino acid, with a concentration of about 500–900 µmol/l. 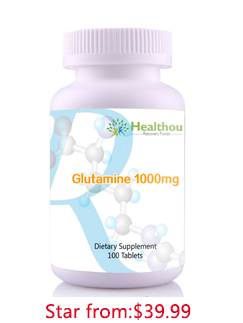 Glutamine is synthesized by the enzyme glutamine synthetase from glutamate and ammonia. The most relevant glutamine-producing tissue is the muscle mass, accounting for about 90% of all glutamine synthesized. Glutamine is also released, in small amounts, by the lung and the brain. Although the liver is capable of relevant glutamine synthesis, its role in glutamine metabolism is more regulatory than producing, since the liver takes up large amounts of glutamine derived from the gut. The most eager consumers of glutamine are the cells of intestines, the kidney cells for the acid-base balance, activated immune cells, and many cancer cells. In respect to the last point mentioned, different glutamine analogues, such as DON, Azaserine or Acivicin, are tested as anticancer drugs. In catabolic states of injury and illness, glutamine becomes conditionally essential (requiring intake from food or supplements). Glutamine has been studied extensively over the past 10–15 years, and has been shown to be useful in treatment of injuries, trauma, burns, and treatment-related side effects of cancer, as well as in wound healing for postoperative patients. Evidence indicates glutamine, when orally loaded, may increase plasma HGH levels by stimulating the anterior pituitary gland. In biological research, L-glutamine is commonly added to the media in cell culture.However, the high level of glutamine in the culture media may inhibit other amino acid transport activities. Glutamine is also known to have various effects in reducing healing time after operations. Hospital-stay times after abdominal surgery can be reduced by providing parenteral nutrition regimens containing high amounts of glutamine to patients. Clinical trials have revealed patients on supplementation regimens containing glutamine have improved nitrogen balances, generation of cysteinyl-leukotrienes from polymorphonuclear neutrophil granulocytes, and improved lymphocyterecovery and intestinal permeability (in postoperative patients), in comparison to those that had no glutamine within their dietary regimen, all without any side effects. Glutamine is the most abundant naturally occurring, nonessential amino acid in the human body, and one of the few amino acids that can directly cross the blood–brain barrier. In the body, it is found circulating in the blood, as well as stored in the skeletal muscles. It becomes conditionally essential (requiring intake from food or supplements) in states of illness or injury. Dietary sources of L-glutamine include beef, chicken, fish, eggs, milk, dairy products, wheat, cabbage, beets, beans, spinach, and parsley. Small amounts of free L-glutamine are also found in vegetable juices. SUGGESTED USE: As a dietary supplement, take three tablets daily. CAUTION:Do not exceed recommended dosage. This product is not intended for pregnant or nursing mothers or children under the age of 18. If you have a known medical condition and have questions about the advisability of taking this product, consult your physician prior to use.